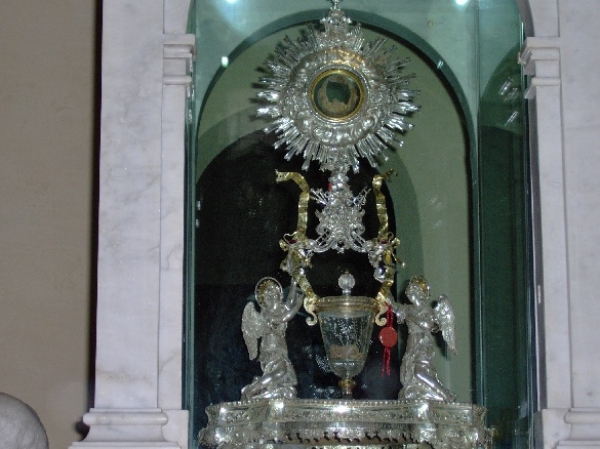 In Lanciano the Sanctuary of the Franciscan order receives the divine manifestation of a miracle: around the year 700 while a priest was celebrating the Mass, the consecrated wine and host transformed into blood and meat. Nowadays the Sanctuary, renamed Sanctuary of the Eucharistic Miracle is destination of a strong pilgrimage. It is the oldest Eucharistic miracle among the ones recognized by the Catholic Church. However, the oldest recognized written documentation dates back to the 1586. According to the transmitted rite, a Brazilian monk, while he was celebrating the Mass in the church of the Saints Legonziano and Domiziano, doubted of the real presence of Jesus into the Eucharist. In that moment the host became meat and the wine became blood. In the successive centuries the church of the saint Legonziano and Domiziano passed from the Brazilian monks to the Benedictine ones and afterwards to the Franciscan ones, who in 1252 began the building of a new church, dedicated to Saint Francesco, on the existing one and they still live there.The chapel who keeps the very precious Eucharistic Treasure made of the Saint Relics is decorated by pictures restored with extreme cure and by marble monuments that have a huge artistic fascination. 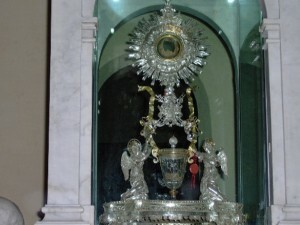 The relics of the Eucharistic Miracle are permanently exposed on the altar of the Basilica of Lanciano.